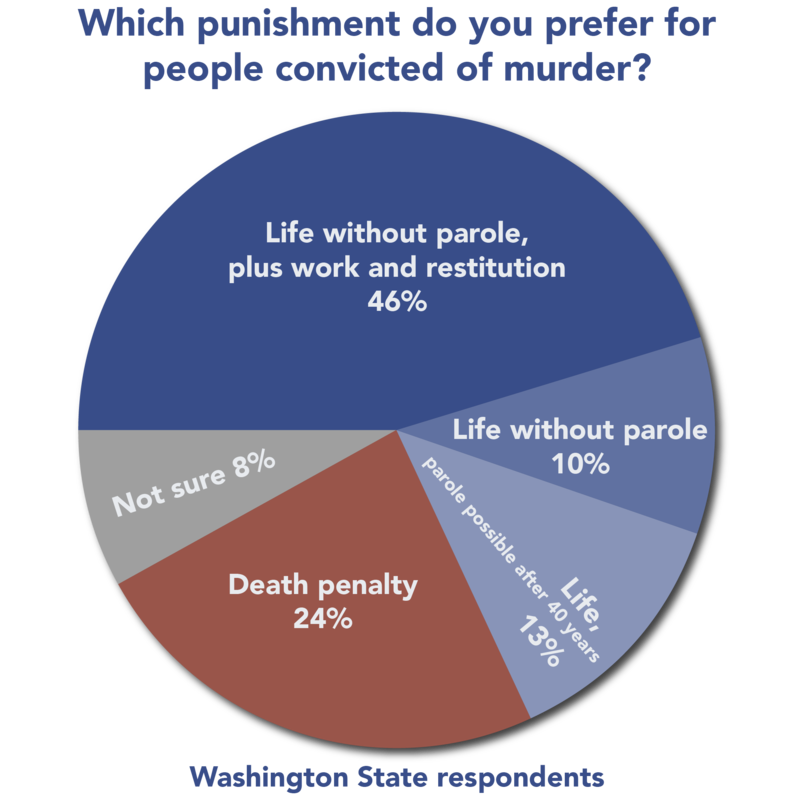 A new poll of likely voters in Washington State shows that Washingtonians are nearly 3 times more likely to prefer some form of a life sentence to the death penalty as punishment for defendants convicted of murder. The poll, commissioned by the Northwest Progressive Institute (NPI), was conducted by Public Policy Polling and released on July 12, 2018. It found that 69% of likely voters in the state preferred some version of a life sentence as punishment for people convicted of murder, as compared to 24% who said they preferred the death penalty. In a statement describing the poll results, NPI said "not a single subsample within the survey favored the death penalty… not even Donald Trump voters. ... What this tells us is that there is broad agreement across the ideological spectrum for getting rid of the practice of putting convicted murders to death." The poll asked respondents: "Of the following list of choices, which punishment do you prefer for people convicted of murder: life in prison with NO possibility of parole, life in prison with NO possibility of parole and a requirement to work in prison and pay restitution to the victims, life in prison with a possibility of parole after at least forty years, or the death penalty?" The most preferred option was life in prison without parole, plus restitution, which 46% of all respondents supported. An additional 10% preferred life without possibility of parole, while 13% favored life in prison with parole eligibility after at least forty years. 8% said they were not sure. Every political demographic preferred some version of a life sentence over the death penalty: 82% of respondents who identified themselves as Democrats favored one of the life options, as did 63% of Independents or supporters of a minor party, and 54% of Republicans. 48% of respondents who said they voted for Donald Trump preferred one of the life-sentencing alternatives, as compared with 46% who preferred the death penalty. In 2014, Gov. Jay Inslee imposed a moratorium on executions, saying that "[t]he use of the death penalty in [Washington] state is unequally applied." A bipartisan bill to abolish the death penalty passed the state senate and was approved in the House Judiciary Committee in 2017, but House Speaker Frank Chopp, a Democrat, did not bring the bill to a vote in the full House before the legislature adjourned. "Five Republicans stood with us in the Senate," said Reuven Carlyle, a Democratic senator from Seattle, "but the House leadership was still unwilling to bring it to the floor." Washington's Democratic Attorney General Bob Ferguson, who along with his Republican predecessor Rob McKenna have urged legislators to repeal the state's capital-punishment statute, said he was "not shocked by the numbers." He said the public mood about the death penalty has "been changing quickly" and "we need additional legislators to help out. ... This poll will further signal to them that not only is this the right thing to do, to abolish the death penalty law in Washington state, but is precisely what the people of Washington state want and expect their legislature to do." (Click graphic to enlarge.) Washington juries have not imposed any new death sentences in more than five years and the state last carried out an execution in 2010. New Hampshire Governor Christopher Sununu (pictured) has vetoed a bill that would have abolished the state's death penalty. Surrounded by law enforcement officers as he vetoed the bill on June 21, 2018, Sununu said, “[w]hile I very much respect the arguments made by proponents of this bill, I stand with crime victims, members of the law enforcement community and advocates for justice in opposing it. New Hampshire does not take the death penalty lightly and we only use it sparingly.” New Hampshire has only one person on death row, Michael Addison, who was sentenced to death for killing police officer Michael Briggs. No one has been executed in New Hampshire since 1939. The death-penalty repeal bill, which applied only to future cases, passed the state Senate by a 14-10 vote in March, and passed the House by a 223-116 vote in April. It received bipartisan support in both legislative houses. While Sununu invoked the views of crime victims and law enforcement in opposition to repeal, Rep. Renny Cushing, a repeal supporter whose father was murdered, said not all crime victims agree. “Many murder victim family members in our state paid a very painful, harsh price for the right to tell Gov. Sununu that we don't want killing in our name. The reality is that the death penalty does not do the one thing we wish it would do: bring our loved ones back.” When the repeal bill passed, Rep. Richard O’Leary, a former deputy police chief in Manchester, said he voted for the bill because “I don’t believe we have the right under any circumstances, except immediate self-defense, to take a life. Once the criminal has been subdued, arrested, segregated from society and rendered defenseless, I cannot see where the state has any compelling interest in executing him. It’s simply wrong.” This is the third time since 2000 that New Hampshire has come close to abolishing capital punishment. In 2000, Governor Jeanne Shaheen vetoed a repeal bill that had passed both houses of the legislature, and in 2014, a bill passed the House and garnered the support of Governor Maggie Hassan, but failed on a tie vote in the Senate. A DPIC study of 29 years of FBI homicide data found no discernible relationship between state murder trends and the presence or absence of the death penalty, and provided evidence that the death penalty has not made police officers or the public safer. The study found that murder rates in general and murders of police officers are consistently higher in states that have the death penalty and that police officers were killed at a rate 1.37 times higher in current death-penalty states than in states that had long abolished capital punishment. All six states in New England have murder rates well below the national average. Five New England states are among the ten safest states in the country for police officers. However, in New Hampshire—the only New England state with the death penalty—officers are killed at a rate higher than the national average. An attempt by Illinois Governor Bruce Rauner (pictured) to reinstate Illinois' death penalty by attaching it as an "amendatory veto" to proposed gun-control legislation has failed. Rather than accede to a plan that would condition stricter gun regulation upon reintroducing the death penalty for murders of police officers and any murder with more than a single victim, the state legislature rewrote the gun-control measure the governor had amended, dropping any mention of capital punishment. In May, Gov. Rauner used an amendatory veto—a power some governors are granted that permits them to amend legislation in lieu of an outright veto—to add death-penalty reinstatement to a bill that created a 72-hour waiting period for gun purchases. The governor's provisions would have created a new crime of "death penalty murder," potentially applicable whenever a police officer or more than one person was killed, subject to a "proof beyond all doubt." Rauner touted his changes, which also included additional gun control measures, as a comprehensive public-safety policy, but critics called it political grandstanding and state prosecutors objected to its adoption through the veto process without meaningful review and consideration. In a letter to the state House Judiciary-Criminal Committee, John Milhiser, the association's President, wrote: "there is no consensus of opinion on support for the death penalty" among Illinois prosecutors, but they agreed that the proposal "involves constitutional and legal concerns that cannot be evaluated in the brief time thus far allotted." Democratic state Rep. Jonathan Carroll, the gun-control bill's sponsor, said the governor had not consulted him about possible changes and had "hijacked my bill and put politics ahead of policy." 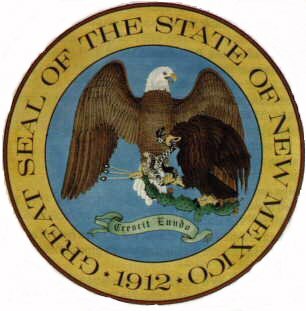 The state house held a brief hearing on the bill on May 21, but did not act on it within the 15-day state constitutional window prescribed for consenting to an amendatory veto. On May 31, 2018, the final day of the legislative session, the legislature passed a clean version of the 72-hour waiting period bill, with no mention of the death-penalty proposal. Governor Rauner has 60 days from passage to take action on that bill. 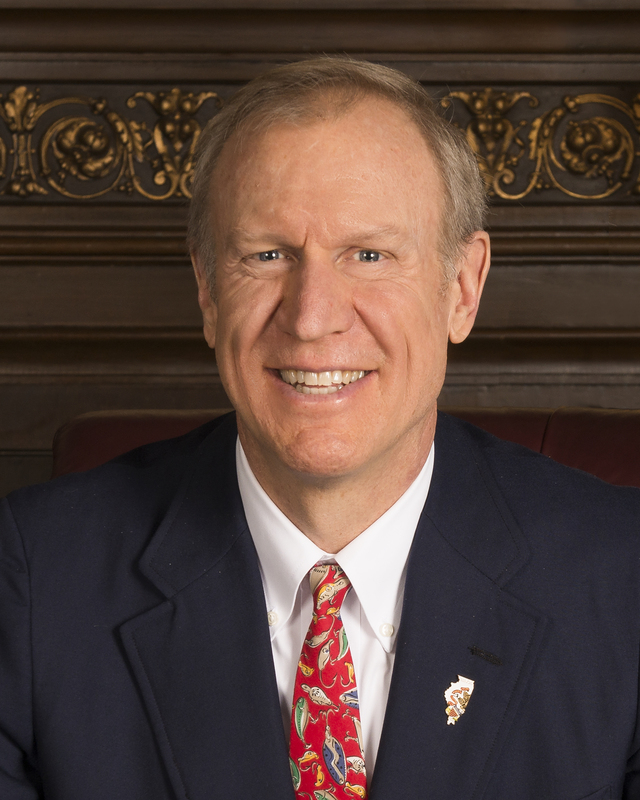 lllinois Governor Bruce Rauner has conditionally vetoed a gun-control initiative unless the legislature agrees to reinstate capital punishment in the state. Exercising an amendatory veto—a power some governors are granted that permits them to amend legislation in lieu of an outright veto—Rauner called for making the killing of a police officer or any murder in which more than one person was killed a new crime of "death penalty murder." In a May 14, 2018 news conference at the Illinois State Police forensic laboratory in Chicago, Rauner said "individuals who commit mass murder, individuals who choose to murder a law enforcement officer, they deserve to have their life taken." He attached his death-penalty plan and several other gun-control amendments to a bill that would have established a 72-hour waiting period for the purchase of assault rifles in Illinois. Legislative leaders and major Illinois newspapers blasted the action as diversionary political gamesmanship by a weakened governor facing a difficult re-election campaign, and said the death-penalty plan had little chance of enactment. Democratic state Rep. Jonathan Carroll, the gun-control bill's sponsor, said the governor had not consulted him about possible changes and had "hijacked my bill and put politics ahead of policy." 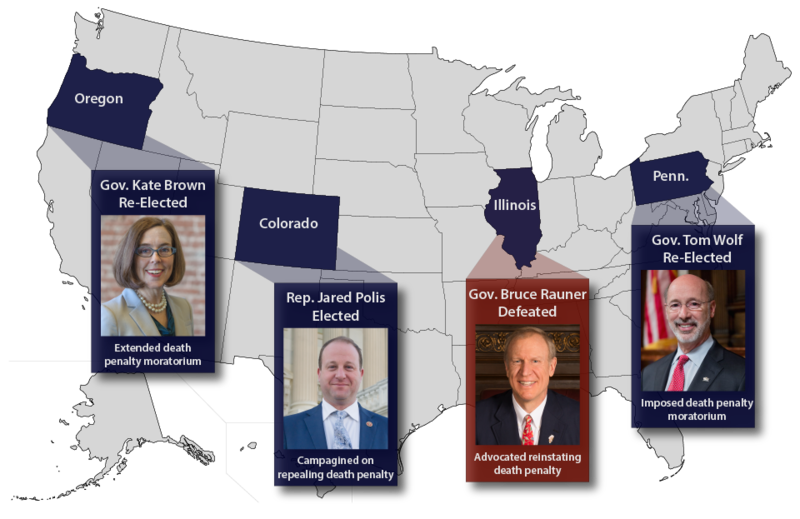 Senate President John Cullerton said: “The death penalty should never be used as a political tool to advance one’s agenda. Doing so is in large part why we had so many problems and overturned convictions. That’s why we had bipartisan support to abolish capital punishment.” Thomas Sullivan, the co-chair of Commission on Capital Punishment in Illinois appointed by Republican Gov. George Ryan, said Rauner's plan was a “lousy idea.” He called the death penalty expensive and time-consuming, and said, "It doesn’t reduce crime." The Chicago Tribune editorial board characterized Rauner's amendatory veto as "cynical" and a "death penalty ploy" that the paper said was intended "to re-establish [Rauner's] bona fides with disgruntled conservative Republicans." A Chicago Sun-Times editorial said the governor knew he was "load[ing] up the bill with so many major new provisions that there is no way" the state legislature would approve it, enabling Rauner to claim he "didn’t technically kill the cooling off period ... without strictly telling a lie." In 2000, after a series of death-row exonerations, Ryan declared a moratorium on executions in Illinois and appointed the commission, and in 2003 commuted the sentences of everyone on the state's death row. Democratic Gov. Pat Quinn signed a bill to abolish the state's death penalty in 2011. The Tribune editorial said: "The death penalty issue in Illinois was examined and debated for years in light of notorious incidents of wrongly convicted defendants sent to death row. In Illinois, the legitimate sentiment of many that certain heinous criminals should be put to death was weighed against the risk of errors, and the decision was made to end capital punishment. ... [N]othing has changed to make Rauner’s [May 14] announcement worthy of consideration."